uuid : b6f54525-de2b-4633-808f-b9de98f38092 templates_id: 119559 templates_uuid: "068e361a-78d8-4b9a-9d31-5bf74a415590" title: "Tenant\'s agreement | Exclude security of tenure " display_name: "Tenant\'s agreement to exclude security of tenure" meta_keywords: "Tenant\'s security of tenure declaration" description: "
This declaration should be used in response to receiving a landlord\'s notice to exclude security of tenure. Security of tenure is the right of a tenant to occupy a property after the lease expires. A commercial tenant should use this agreement to state they understand the implications of entering a lease without security of tenure. There are two ways to respond to the landlord\'s notice, either by way of a simple declaration or statutory declaration. 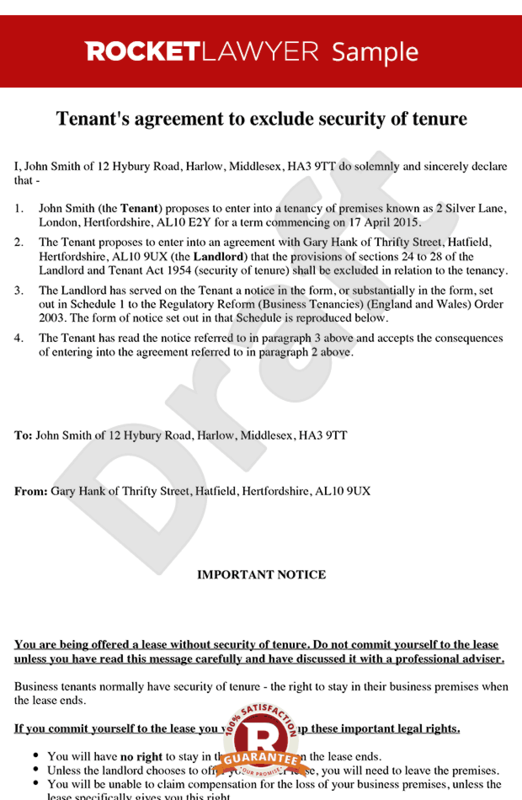 The type of declaration chosen will depend on the time left remaining before a tenant has to commit to the lease. This declaration excludes the provisions of sections 24 to 28 of the Landlord and Tenant Act 1954. This tenant\'s simple and statutory declaration is governed by the law of England and Wales.
" created_timestamp: "2018-10-08 04:36:56.0" modified_timestamp: "2018-10-08 04:36:56.0" active: true created_by: 102 modified_by: 102 dcm_id: 344 url_slug: "Tenants-agreement-to-exclude-security-of-tenure" meta_description: "Agree to exclude security of tenure with this declaration. Use this in response to being served a notice to exclude security of tenure s24-28 of the LTA 1954. " time_to_complete: "10 minutes"
This declaration should be used in response to receiving a landlord's notice to exclude security of tenure. Security of tenure is the right of a tenant to occupy a property after the lease expires. A commercial tenant should use this agreement to state they understand the implications of entering a lease without security of tenure. There are two ways to respond to the landlord's notice, either by way of a simple declaration or statutory declaration. The type of declaration chosen will depend on the time left remaining before a tenant has to commit to the lease. This declaration excludes the provisions of sections 24 to 28 of the Landlord and Tenant Act 1954. This tenant's simple and statutory declaration is governed by the law of England and Wales. More than just a Tenant's agreement to exclude security of tenure template, our step-by-step interview and guidance makes it easy to create your document. Easily create online, download, print and sign your free Tenant's agreement to exclude security of tenure in minutes. This document is also sometimes called: Tenant's security of tenure declaration.